The "Take It!" came from having spent hours out on the road, making a stop at a signal, and suddenly seeing a small eye catching bit of what would not ordinarily be looked at. The black plastic framing of this portion of someones hand gripping a steering wheel just seemed to pull me into a quick grab of my camera and barely enough time to focus and snap the shot. 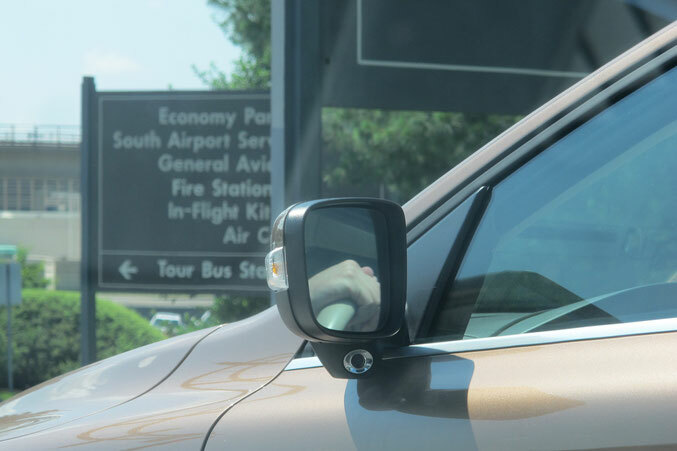 It is almost as if the rear view mirror on this SUV is offering a tiny framed window into the interior of the vehicle. The After Take: To the few I have shown this to, the reaction is much like mine. It is a most unusual shot. I think I like it for the title it offered and the chance to make the catch happen in the short span of time it was available. Here is hoping that when a long day is happening, something will come along that grabs your eye and jolts your senses and imagination. The sensation is ever so much more effective than a cup of coffee - lol. That'd be cool if the person saw this picture somehow. I have had many an awkward occasion making eye contact with a person through the side mirrors and the rear view mirror. Nice play on the age old cliche! As my son says, "I see what you did there."